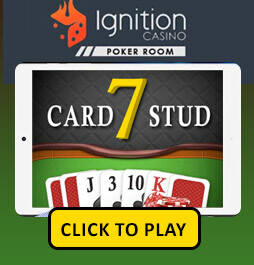 Here you can find Seven Card Stud poker sign up bonuses, reviews, online poker rooms that offer 7 card stud, tournaments, winning strategy, seven card stud books, and poker terms. We also dedicate a special section for Razz (7 card stud where the best low hand wins) which is gaining popularity in various poker rooms. Seven card stud is the most popular version of stud poker. It is played with two and eight players. Every player is dealt a total of seven cards, three of them face down, and four face up. The objective of seven card stud is to make the best five card hand using any combination of the seven cards dealt. 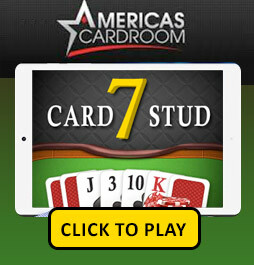 7 card Stud is one of the most commonly played card games in poker. The basic concepts are easy to learn making it an attractive game to new players. To master the game, however, is very difficult. The three most popular variations of this game are Seven Stud High, Seven Stud Low (Razz), and Seven Stud High-Low Split. Seven card stud is quite different from Texas Hold’em and Omaha. It is played with up to eight players at the table and each player is dealt seven cards, starting with two cards (hole cards) face down and one card face up. Then, three more cards are dealt to each player face up, with betting rounds between them. Then a final card is dealt face down, followed by the final betting round. The player with the best five-card hand wins the pot.